I first met Madagan two weeks after she was born in October 2007. 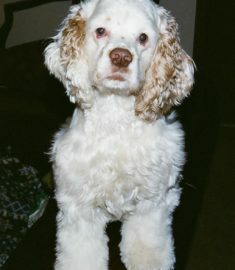 Her mother, Maggie, went into labour with her and her five brothers at 11:45am EST exactly four minutes after my previous cocker spaniel, Casey, had passed away. It was as if Casey’s soul flew 8 miles in those 4 minutes to join up with Madagan’s body. The breeder said that the 5 brothers were born before Madagan and that they really would’ve been happy to stay in their mothers womb for a few more days but it was like Madagan was kicking them out as if she had to be somewhere to meet someone. That someone was me….From the minute I saw her and the breeder tell that story I knew that she was going to be special to me . You see, three years earlier in September of 2004 I suffered a career ending spinal injury and was limited as to what I could do and where I could go. Casey was 16.5 yrs old when she passed so as an older dog she wasn’t as demanding as a pup. Madagan was going to be my therapy dog. I trained her to take me outside every two hours so that my muscles wouldn’t atrophy and despite the season or weather she has done that and so much more for me. It’s as if she has an inborn clock that rings every 2 hours and she’s by the door signaling me to get up and get walking or get down on the floor and play. She’ll be eleven this September and is still very active, ready to go for walks and to be the neighborhood “greeter”. I know a clone of her will not have her exact personality but I’m a believer that a dog gets their personality from the person/people around them. Madagan is my sixth cocker spaniel and she’s my first dog that I’ve been able to spend every minute of the day with as we eat, sleep, walk & play together. The only time we’ve been apart was for my 4 surgeries and her 1 night stay over after she was spayed. There’ll be no way to replace her but she will do a great job teaching her clone the ropes as she lives out her days and her clone begins her role in our family. P.S. Madagan will be going in to have her teeth cleaned this Tuesday, May 29th and at that time the tissues samples and cheek swaps will be taken. Please be on the lookout for the samples soon after the 29th. I want the tissue samples stored for now as we will be looking for a new house and then we will notify you when to begin the cloning process. Thanks for all your help!